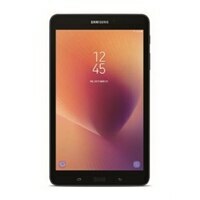 Samsung Galaxy Tab A (2017) - Tablet - Android 7.1 (Nougat) - 32 GB - 8-inch TFT (1280 x 800) - microSD slot - blackThe Galaxy Tab A features a refined design with a sleek metal frame and smooth rounded edges that's comfortable to hold. It offers long-lasting battery, a beautiful display that looks good in any light, and increased onboard memory with expandable storage. To improve everyday usability and performance, the Galaxy Tab A is equipped with a bright and immersive display, so you can watch your favorite shows, play games and browse the web on an immersive screen that looks good even in bright sunlight. It also has an optional blue light filter to balance the brightness and reduce eye strain, making it easier to see content at night and in dim lighting settings. ⚠ WARNING: Reproductive Harm - www.P65Warnings.ca.gov. The Galaxy Tab A features a refined design with a sleek metal frame and smooth rounded edges that's comfortable to hold. It offers long-lasting battery, a beautiful display that looks good in any light, and increased onboard memory with expandable storage.